Itamar Erez has made Vancouver his home 3 years ago after establishing himself internationally as a well sought-after guitarist, composer and teacher. His approach to teaching is unique and he enjoys sharing his vast musical knowledge with his students of all levels. His new book “Exercises & Etudes- An Advanced method for the Finger-Style Guitarist”shares some of his insights with guitarists all over the world, and now with Vancouver-based students and teachers. As a teacher, Itamar gave guitar masterclasses at the “Vancouver International Guitar Festival”, “Woodstock Invitational Luthiers Showcase (Woodstock NY), “Tel-Aviv International Guitar Week” (Tel-Aviv, Israel) and at the prestigious “Codarts University for the Arts” (Rotterdam, Netherlands). He is known as a master, not only of the classical music genre, but also of many other genres such as jazz & flamenco. 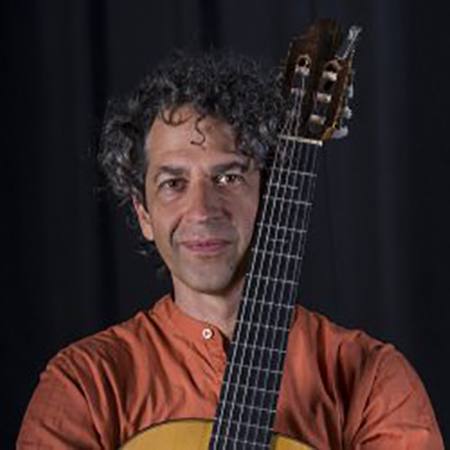 Recipient of the 2014 ACUM Prize for Special Achievement in Jazz and the prestigious 2014 Landau Prize, Itamar Erez is an internationally renowned composer and guitarist who has shared the stage with such musicians as Omar Faruk Tekbilek, Tomatito, Avishai Cohen, Jean-Louis Matinier, Zohar Fresco, and others. Itamar has released 3 CDs of his original music, and has recently performed at the Carnegie Hall (NYC). Among other prestigious venues, Itamar has played at the Sydney Opera (Australia), the Barbican Centre (London UK), the Royal Opera House (Muscat, Oman), and the Megaron (Athens, Greece). Itamar is currently working on his 4th CD to be released in 2019.